The Armed Forces Flag Day was observed in Raj Bhavan, Itanagar, Governor, Ministers and officials donate towards Armed Forces Flag Day. Along with rest of the country, the Armed Forces Flag Day was observed in Raj Bhavan, Itanagar on 7th December 2018. 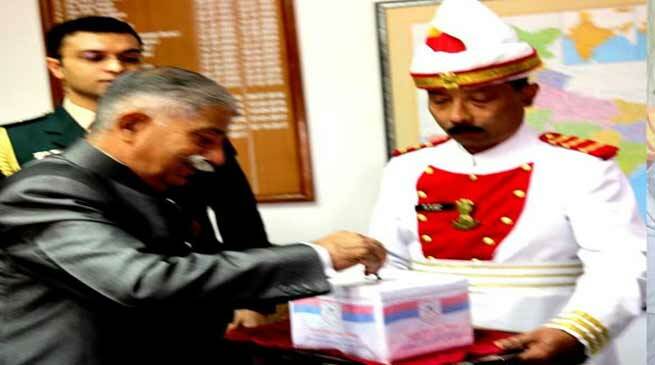 The first to donate towards the Armed Forces Flag Day Fund, on the day, in the State was the First Citizen of the State, the Governor of Arunachal Pradesh Brig. (Dr.) B.D. Mishra (Retd.). Exhorting the officers and staff of the Raj Bhavan to donate generously towards the noble cause, the Governor said that Armed Forces Flag Day, which is being observed since the year 1949 gives us an opportunity to honour the martyrs who valiantly fought for the defence of the Nation. It is also a day to remember and recognise the sacrifices and dedicated services rendered by them, the Governor said. Armed Forces Flag Day also provides us an opportunity to discharge our obligation of looking after the disabled comrade-in-arms, Vir Naris and dependents of those who have made the supreme sacrifice for the country, he said. The Raj Bhavan, Itanagar Armed Forces Flag Day Team collected contributions from State Home Minister Kumar Waii and Minister for Parliamentary Affairs Bamang Felix and many others on the Day. The collection proceeds have been credited to the Armed Forces Fund.